I have been stamping/crafting about 26 years, seriously though since my oldest daughter was about 1 year old! Using Elizabeth Craft Design stickers on cardstock with double-sided adhesive, glitter added and colored in using alcohol markers has to be one of my favourite techniques right now. I love deep, bold, bright, & jewel tones such as Royal Blue, Amethyst Fuchsia, Plum, Burgundy, Jade, Ruby & Asian Red, all metallic (golds, silvers, bronzes, coppers), Opaline, & anything shiny and sparkly…you get the picture?! I like anything Asian from any company but particularly those images that have an “open concept” to it for allowing coloring or adding designs to. I really do like the cuteness of ‘Sister Stamps’, though. Sizzix Big Shot and all my thin metal dies along with my Silhouette Cameo electronic die cutting machine have to be my fave. They are so much fun to use and instant gratification in getting a finished little item. My paper personal paper cutter is a must! Make and keep a duplicate of your cards/artwork if you can. If you don’t have time, scan or photograph your artwork at different angles. This way you’ll have something to look back on for reference if you ever want to make another. Joining swaps is a good way to challenge your thought processes and make new and exciting projects to share with others. In grade 6, I was to do a report on Japan and present it in front of my class. My parents were friends of a wonderful “mixed marriage” couple. Bob was a journalist who had come over from Britain and Akiko his Japanese wife were willing to help me out with my project. I got the report done with their help/research. But what was the most exciting about the presentation was that I got to wear a beautiful Kimono that Akiko dressed me in! I remember it took almost an hour to get dressed, right down to the tabi and geta! This was the most memorable moment as I was growing up and made quite the impression on me! Well, needless to say I was drawn into and fell in love with the Japanese culture because of this. I really enjoy creating anything with an Asian ‘twist’ to it! I tend to buy more books than magazines, but when I do purchase any, they are usually Stamper’s Sampler, Australia Paper Crafts, Take Ten, or Scrap and Stamp. I had been published in a few Canadian magazines in the past – ‘Stamp Stories’ and ‘The Canadian Stamper’. As well, I have been published in the ECS (Edmonton Calligraphic Society) newsletter numerous times and have written articles for them. I also was a regular for the first few of years of a US magazine – ‘Expressions’ but unfortunately the editor folded it after a few years. I think I’ve tried every possible type of “craft” out there but I particularly like to crochet, knit, bead, make books, rubber stamp and marble paper. I had my own internet based marbled paper business which I started in 1999…it’s slowed down a bit when I went back to working and just shut it down about 2 years ago. I’m not sure what “inspires” me, but I have this inert “drive” to try something new and create things…it really drives my husband crazy…our house is in a state of “creative disorder” constantly. This summer I finally got around to cleaning out my craft room and got rid of a lot of stuff but somehow the mess has now turned into an orderly clutter! I took classes in clay work and wheel throwing (claywork-wheel throwing, NOT really throwing wheels around!!! *grin*), but am pretty much a self taught artist. I have no formal training, although I have taken many workshops and classes from who I would consider “master” artists. Elizabeth Craft Designs – http://www.ecraftdesigns.com/ even though she has some Asian inspired stickers etc, Els does make some fabulous cards…and has all that is sparkly and shiny which I love. (As will be able to tell from my project) The other is Karen Burniston — http://karenburniston.typepad.com/ who makes some great kinetic kinds of cards using her dies. She used to design for Sizzix but now she designs and works with Els. I was a pediatric nurse once upon a time…B.C. (that’s Before Children), and quit to become a stay at home mom but now that they have grown up and two have moved out of the house, I have a job working in two schools; one as a part-time Educational Assistant and Library Tech and the other as just a Library Tech. I love working with the kids and the books they read!! I have been married for almost 30 years to my husband (George) and am (still) mom to 4 girls – Kirstin 26, Bethany 24, Melanie 23 and Heidi 21. We also have Spaniel (also a female in the family…my poor husband sure feels out-numbered!). We live in Edmonton, Alberta, in Canada. Our city may seem pretty far north to some people, but really we’re not as far as you may think! I love the fact we get 4 seasons here…albeit spring and autumn can be shorter than they should be, and we sometimes get way too much snow for my liking in the winter but the HOT summers make up for it! I also love the fact that in the summer, the sun doesn’t set until almost 11:00pm! But our winter days are pretty short! We have a saying here: We have TWO seasons—Winter and Construction—which seems to be exactly what’s been happening on our side of the city right now! I have to say that although I’m not overly active on OSA I have been a long time member and love being involved with it when I can (I host the yearly OSA APE swaps) and appreciate the fact there is a group of Asian art enthusiasts I can be part of!!! It’s the best group that I’m involved with and do feel honoured to be chosen as OSA’s SAM this month! Thanks so much! 1. 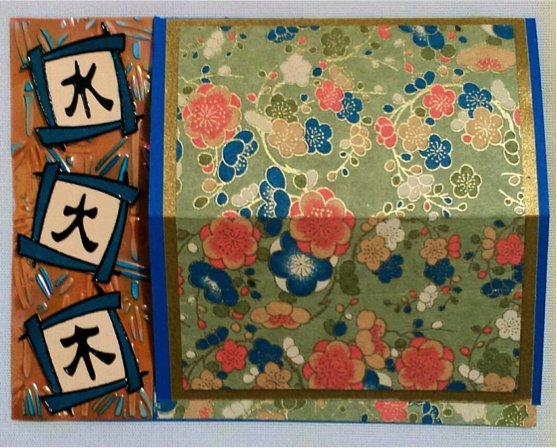 Fold card base in half and cut away piece from top left side as shown and fold top right side in half as on card sample. 2. 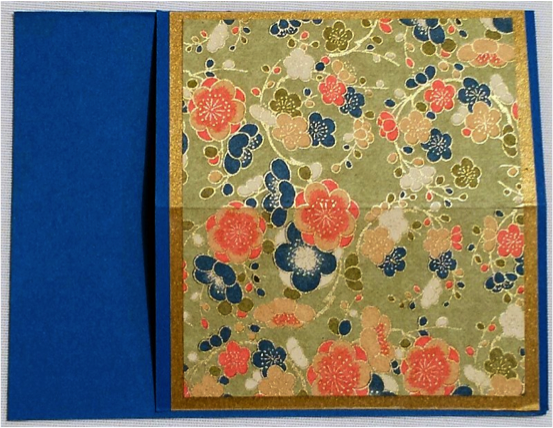 Adhere large piece of Washi paper onto Velum (Gold) sheet and apply to front of card as shown. 3. Emboss strip of Shimmer Sheetz with embossing folder, sand top of design and then gently apply StazOn over design using application foam (such as a Tim Holz application tool). Lay piece aside. 4. 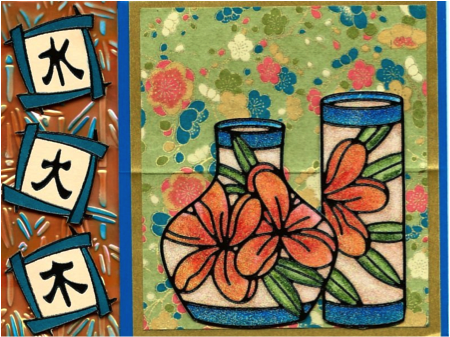 Apply 3 Asian Character stickers & borders to scrap cardstock. Color in border pieces using alcohol marker of choice. Cut these pieces out around outer edges of the borders and lay aside. 5. 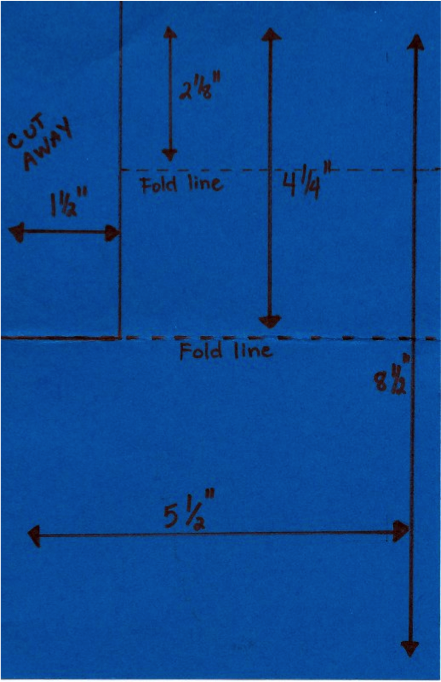 Open up card and measure 1-1/8” up from bottom and center on right hand side of card with flap at top. 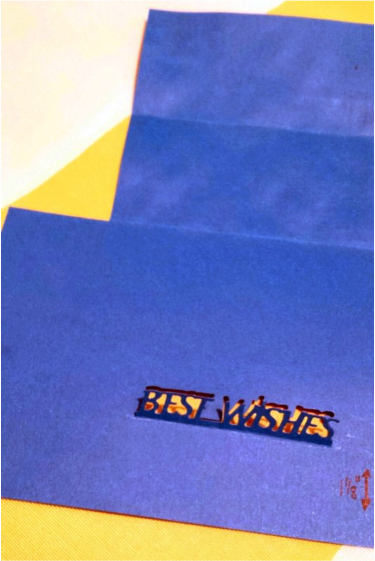 Die cut out the “BEST WISHES” stand up helper die. (Click thumbnail for larger image). This photo shows how the die will look like when cut out. (The words stand out & upright and will hold the top flap up when folded over and in behind the words—but will leave a “hole” in the card where the words are cut out from.) At this point you may cut another die from a scrap piece of glossy black cardstock, cutting it out along the bottom line, add glue to the back and adhere over top of the existing letters. This will enhance the words. 7. 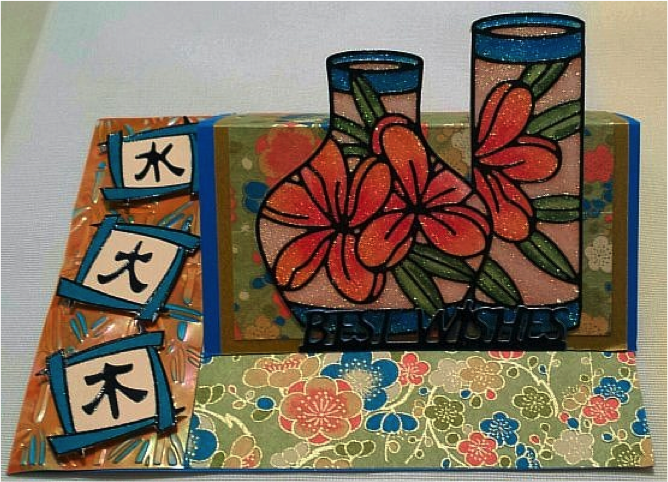 Adhere the cut out Asian Characters using pop-dots to the piece of prepared embossed Shimmer Sheet and glue this completed piece to the strip of exposed card on the left hand side of the card. 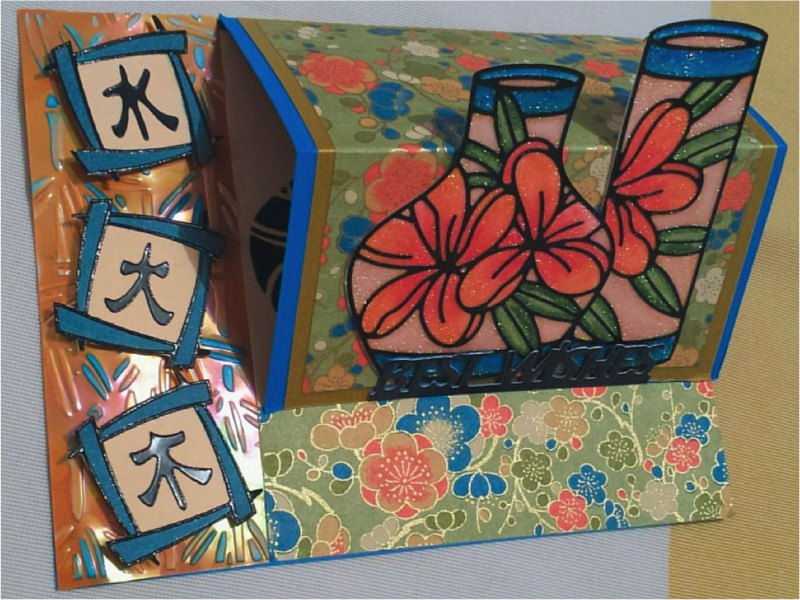 Glue the small piece of Washi paper (1.25” x 4”) along the bottom edge on the right hand side of the card (below the die cut words). 8. Stick a piece of double sided sticky sheet (such as Sookwang tape brand) to a piece of white cardstock. 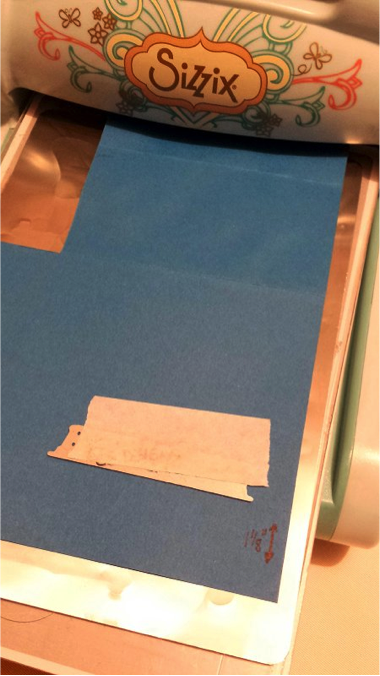 Remove the protective liner and apply two sticker vases on the exposed tape. 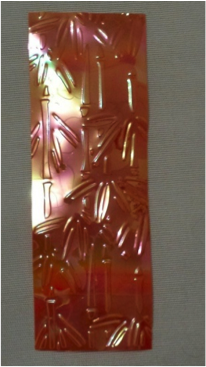 Sprinkle the ‘warm highlights’ superfine glitter to the tape and burnish with your finger. 9. Color vases using alcohol markers as desired to match your Washi paper design and cut out around shaped edges of the design. 10. 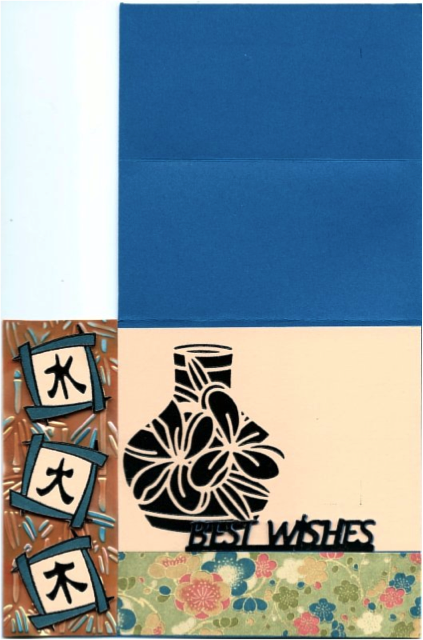 Using a piece of transfer tape, adhere the “negative” portion (leftovers on the sticker sheet) of the larger vase to to the inside of the card. 12. Your card is now complete and ready to send in the mail. 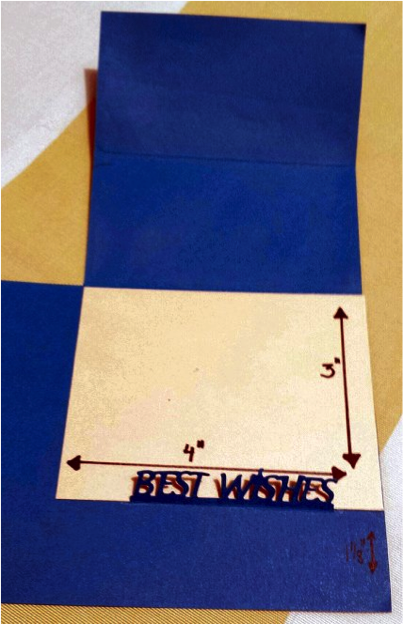 The recipient need only lift the flap, fold over slightly and tuck it in behind the sentiment. Congratulations Sonja…enjoyed reading your profile and learning about your cool project. Enjoy your month in the limelight and once again congratulations! WOW a terrific project and technique which I can’t wait to try out. October is the perfect month for you to be SAM. Fall is a short period up north from reading your bio but definitely treasured and you are our SAM treasure for October. CONGRATULATIONS. Congratulations on being the October SAM…hope you enjoy each and every minute! Thank you too for the great instructions for this unique technique!!! Many congratulations on being chosen as this month’s SAM! Such a beautiful creation and new technique, wow! Thank you for the video and instructions too! That’s got the creative juices flowing!!! Enjoy your month in the limelight! Congratulations on being the October SAM Sonja; I really enjoyed reading your bio – what fun to get to dress up in a kimono when you were young! I really like your project with very good instructions – must have a go at this soon. Congratulations on being our October SAM. I enjoyed reading your bio and learning more about you. Your project is amazing and your instructions look very complete, I can’t wait to try it. Thank you also for being the hostess for OSA-APE, I’m always amazed at the different types of bindings your create for our books.